Want to predict the future? Forecast the winner of Eurovision 2011 before the final with the iGoogle Predictor gadget or with MyTVBuddy. Google bases their predictor on the popularity of the artists in the Google search data. Our iPad app MyTVBuddy gives the fans the opportunity to compare real user votes before and during the show with the official ranking afterwards. Download the free app now via the app store and explore all the other fun features it has to offer. Google has announced Google TV today, a new offering set to roll out in the fall of this year designed to integrate the television and Web experience. Built on Chrome and Android, Google is opening up the Google TV platform to developers to allow them to create new applications. In addition, existing Android applications not requiring phone capabilities will be able to run directly on the Google TV platform. From a hardware perspective, Google has partnered with Intel, which is providing its Atom processor to power the Google TV offerings. Google TV will initially be offered as a standalone box from Logitech, as well as integrated directly into Sony TVs and Blu-ray players. Google has also partnered with Best Buy for distribution and with DISH Network to provide one-click integration between Google TV and the satellite provider’s DVR offerings. Google TV has been seen as a significant competitor to Apple’s set-top box known as Apple TV. Apple has long regarded Apple TV as a “hobby”, offering a somewhat limited feature set serving as a hub for music, video, and photo content, as well as access to the company’s iTunes Store. Google is working with Intel, Sony, and other partners to develop Google TV, a service aimed at putting the Internet search giant’s Web offerings in people’s living rooms, the New York Times reported Wednesday. The TV technology will run on Intel’s Atom chips and Google will develop a new version of its Chrome browser for the TV project. Google will open the TV platform to Android developers as part of the initiative, with a software developer’s kit. Mobile Marketing will soon become more popular than traditional online advertising, predicts Vic Gundotra of Google. With the usage of smartphones still on the rise, Google expects companies will pay higher rates for mobile search ads than standard PC-based ones. During a webcast on Monday, Gundotra added that ad rates (CPC) for the mobile channel have already increased “dramatically” over the last few years, with mobile searches also rising fivefold over the course of two years. And not only Google is enthusiastic about Mobile Marketing. According to The State of Marketing 2010 study by Unica, conducted with Salloway and Associates, more than one-third of executives questioned said they already use mobile in their campaigns, stating that the richer interactivity of mobile websites and applications makes it an equal draw to text messaging. “2010 is shaping up to be an exciting year for marketers. Unprecedented change, brought on by a volatile economy, the rise of new channels and the increased demand for financial accountability, are creating a new era in marketing,” said Paul McNulty, chief marketing officer at Unica. Normally Google does not give the number of applications in the Android Market, but today the representatives informed that Google Android Market includes 30,000 free and paid applications. 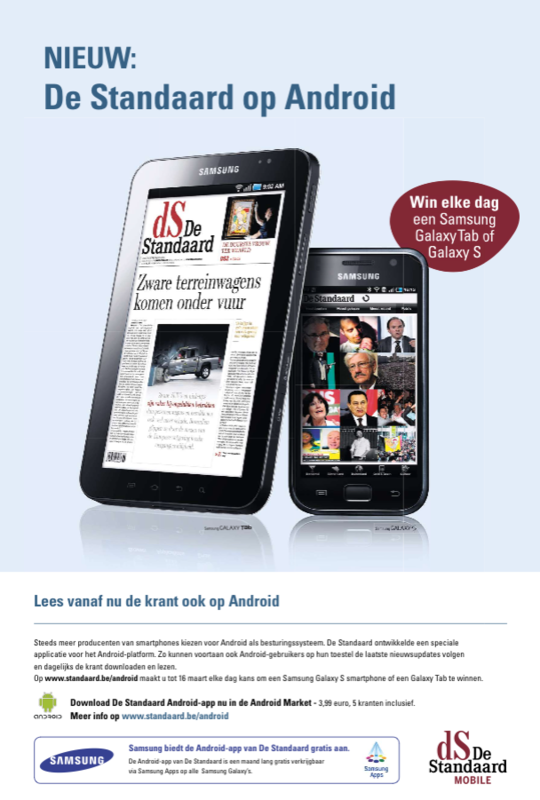 Three months ago there was an estimation from AndroLib that the Android Market included 20,000 applications. Google at the time matched these claimed stats against its own count, and said there were in reality some 16,000 apps in Android Market in December 2009. And today Google says the number grew from 16k to 30k apps in exactly three months, a beautiful performance. Google will not say what percentage is paid or free. But AndroLib, a website which keeps an eye on Android Market, says that 39% is paid and 61% free. Interesting is the fact that paid applications are hardly sell well. FADE analyst has calculated that the estimated 8 million Android users from around the globe have downloaded 289 million apps. Of that 98.9 % was free. Compared with other phones, owners purchase relatively low-paid Android apps. This is around 35 applications per user, so that’s quite a bit. Calculate how much the developers earn from this users, then the number is very disappointing: the average user for Android has bought apps for $ 0.50. For the iPhone it is $ 1. The sales of mobile phones stagnated last year, as a result of the recession. But smartphones were the exception. According to figures by Gartner, 24% more smartphones were sold in 2009 compared to the year before. Nokia, Blackberry and Apple together sold about 172 million smartphones. Also important changes as to the operating system of mobile devices. Even though half of the smartphones still use Nokia’s Symbian, it is clearly losing ground. 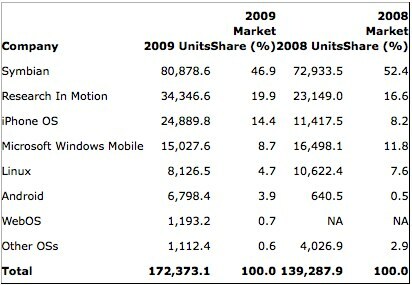 Microsoft Windows Mobile is also on the losing side, being pushed out of the top 3 by iPhone OS. In 2009, iPhone doubled its amount of units sold from 11,8 to 24 million. Big runner-up is Android. The 6,8 million units sold in 2009 were 10 times as much as the year before. According to Google’s Eric Schmidt, there are about 60.000 Google Android phones sold every day now. At that rate there’ll be more Android phones than iPhones by 2011.